In Florida, SunGuide Software is used by twelve users. Each user described below is an agency responsible for operating a certain jurisdiction containing limited access or arterial facilities. Each agency has unique geographic constraints, and each agency has unique expectations for traffic operations and management. The SunGuide software is expected to accommodate the needs of all of these different agencies. Let’s visit the SunGuide users and see what they do and how they use SunGuide software in unique ways. The District 1 regional transportation management center (RTMC), named the SouthWest Interagency Facility for Transportation (SWIFT) SunGuide® Center, is located at 10041 Daniels Parkway, in Fort Myers. This RTMC is approximately 49,800 square feet and houses the Florida Highway Patrol and Office of Motor Carrier Compliance alongside FDOT. The RTMC is open 24/7/365 to monitor traffic and report incidents. One of the unique operations to District 1 is the use of safety barrier alongside the interstate that produces an alarm in the SunGuide software when a vehicle runs into the safety barrier. This alarm is part of the incident detection system that is the first step along the incident management process that operators perform. The District 2 RTMC is located in the District 2 Jacksonville Urban Office at 2198 Edison Avenue, in Jacksonville. This older facility was completed in May 2002, and uses approximately 2,000 square feet of the entire building. A District 2 satellite RTMC is located at the Florida Highway Patrol Troop (FHP) G Jacksonville Regional Communication Center in the Florida Department of Management Services complex at the intersection of Jefferson and State Streets. It operates 24/7 and handles Districts 2 and 3 information dissemination on dynamic message signs in Jacksonville and 511 traveler information throughout North Florida. This satellite RTMC is directly connected with the partners, including: City of Jacksonville Traffic Operations, City of Jacksonville Emergency Operations Center, City of Jacksonville Fire/Rescue, and the Jacksonville Sheriff’s office. District 2 championed the concept and provided the impetus for the Smartphone application for Road Rangers system. This Smartphone application adds tremendous value in efficient coordination between road rangers, TMC operators, and the SunGuide software. One key advantage is a low hardware cost which serves the purpose of a mobile phone as well. District 3’s Pensacola RTMC is located at 580 East Burgess Road, in Pensacola. It operates 16-hours per day/5-days a week. RTMC operators monitor I-10 and I-110 corridors in Escambia and Santa Rosa Counties. They also have a Joint Project Agreement with City of Tallahassee that monitors and controls the I-10 freeway management system. RTMC operators manage a series of portable SMART Zones (portable closed-circuit television cameras [CCTV], sensors, and dynamic message signs [DMS]) in construction areas as well as permanently deployed devices. RTMC operators dispatch Road Rangers to aid the FHP and assist motorists in need. District 3 pioneered the use of license plate readers for automatic vehicle identification that is used to detect traffic conditions for applications such as travel times messaging. This system is the only probe-based technology that does not require additional tags or other hardware in vehicles. District 4 has two RTMCs: the Broward SMART SunGuide® RTMC and the Palm Beach SMART SunGuide RTMC. RTMC operators work closely together and with I-595 Express, Florida's Turnpike Enterprise, Miami-Dade Expressway Authority, and FDOT District 6 to provide a regional approach to traffic management and posting information to the 511 traveler information system. District 4 has developed several additional SunGuide compatible applications including a maintenance and inventory management subsystem that allows tracking and management of the maintenance of ITS devices deployed in their districts. The Broward SMART SunGuide RTMC is located at 2300 West Commercial Boulevard, in Fort Lauderdale and is collocated with the Broward County Traffic Engineering Division and I-595 Express TMC. The Broward SMART SunGuide RTMC is staffed 24-hours a day, 7-days a week, 365-days a year. RTMC operators monitor CCTV cameras deployed along I-95, I-595, and I-75 and post messages to DMSs in Broward County. The Palm Beach SMART SunGuide RTMC is located in the Palm Beach Vista Center Complex at 2300 N. Jog Road, in West Palm Beach. It is staffed 24-hours a day, 7-days a week, 365-days a year. The RTMC is collocated with the Palm Beach County Traffic Engineering Division, where operators monitor traffic and provide incident management within the I-95 corridor between Boca Raton and Jupiter. The District 5 RTMC is co-located with the FHP Troop D Headquarters and the FDOT District 5 Orlando Urban Office at 133 South Semoran Boulevard, in Orlando. This RTMC is the regional hub for the Central Florida Intelligent Transportation Systems (ITS) and operates 24-hours/7-days a week. In operation since 1999, this RTMC provides operations for CCTV cameras, DMSs, and vehicle detector sensors on I-4, I-95, and other arterial state roads via an extensive fiber optic network. District 5 has pioneered the connected vehicle deployment with 28 roadside equipment on I-4 and International Drive. SunGuide operations uses connected vehicle to post traveler advisory messages to motorists and collect traffic speed data from vehicles. District 5 also uses variable speed limit signs. SunGuide uses traffic condition data to automatically calculate congestion levels and propose a new set of speed limits. SunGuide will then update a set of variable speed limit signs after receiving operator approval of a proposed plan. The District 6 SunGuide® RTMC is located at 1000 NW 111 Avenue, in Miami. 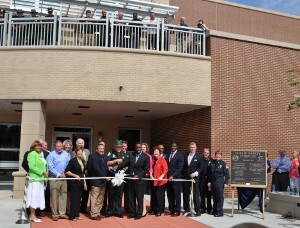 FDOT officially dedicated and opened this RTMC in June 2004. This is a 32,000-square foot facility featuring a multi-screen wall and eight first floor workstations. FDOT uses seven of these workstations and the Miami-Dade Expressway Authority uses one for their staff to monitor and control CCTV cameras, DMSs, and vehicle detectors, and dispatch Road Rangers to clear accidents, remove debris, and assist stranded motorists. Additionally, FDOT uses their workstations to operate ramp signals on I-95 entrances and operate the 95 Express high-occupancy toll lanes. FHP is co-located in the facility and operates 18 workstations on the second floor. The SunGuide RTMC is a 24/7, secured facility, designed to sustain the impact of a major hurricane; it has a diesel emergency generator and an uninterruptible power system supported with batteries for continuous operation during power outages. District 6 has implemented the express lanes with dynamic pricing into their SunGuide operations. SunGuide provides traffic data, and with a proposed plan and operator approval, SunGuide updates the status and prices on dynamic message signs to operator the express lanes. District 6 has also deployed ramp meters to regulate the inflow of traffic onto the interstate to prevent saturation and extreme congestion. SunGuide software operates these ramp meters using a fuzzy logic algorithm. The District 7 Tampa Bay SunGuide® (TBSG) Center is located at the District 7 Headquarters on McKinley Drive in north Tampa, and provides freeway management on sections of I-275, I-75, and I-4. This two-story building has 19,000 square feet of floor area and is a hardened facility, allowing operations to continue before, during, and after hurricanes or other severe storms. The RTMC includes FHP dispatching and the District Emergency Operations Center. Florida Fish and Wildlife, the Florida State Emergency Response Team, Office of Motor Carrier Compliance, and the Florida Department of Law Enforcement will also be collocated in the RTMC. The RTMC became operational in March 2007. District 7 pioneered the use of a mobile road ranger application allowing road rangers to help manage events from the field by entering time sensitive information including event creation, lane blockage and clearance, and event closure into SunGuide through the application. Florida's Turnpike Enterprise operates two RTMCs located in the Pompano Beach Turnpike Operations Center in south Florida at Mile Post 65 and in the Turkey Lake Headquarters complex in Orlando at Mile Post 263. These RTMCs are the central facilities for the control, monitoring, operation, and management of Turnpike traffic and are operational 24/7. Dedicated staff is trained to operate nearly 2,000 ITS devices to monitor and respond to the changing conditions on the 460 miles of the Turnpike system. The original Pompano Beach RTMC came on-line in 1999. It was replaced with a new 11,000-square foot signature RTMC in December 2009, and provides a state-of-the-art ITS platform for Turnpike Operations to work closely with FDOT Districts 4 and 6 RTMCs and FHP Troop K through a liaison position at the Lake Worth Dispatch Center and surrounding emergency responder agencies. The 1,200-square foot Turkey Lake RTMC went into operation in 2002, and works closely with FDOT Districts 5 and 7, FHP Troop K, and surrounding city and county agencies. The Turnpike was the first SunGuide user to operate SunGuide in a virtualized environment. Lee County Traffic Operations Center is located at 5650 Enterprise Parkway, in Fort Myers. It came online in 2011 and it manages traffic approaching US 41 Caloosahatchee River and Edison Bridge. The county uses DMSs, trailblazer signs, highway advisory radios, and CCTV cameras to monitor and disseminate traffic information. Lee County operates trailblazers using SunGuide to help redirect traffic into a safer, more efficient route when the current roadway may not be suitable for travel ahead. Miami-Dade Expressway (MDX) Authority TMC is collocated in the District 6 SunGuide RTMC where traffic is monitored 24/7. MDX currently has ITS installations on SR 836, Dolphin Expressway, from I-95 to SW 137 Avenue. It is adding additional ITS infrastructure on SR 924/ Gratigny Expressway, SR 874/ Don Shula Expressway, SR 878/ Snapper Creek Expressway, and SR 112/ Airport Expressway. MDX was the first non-District TMC to operate the SunGuide software. Central Florida Expressway Authority (CFX) uses the SunGuide software at their main office and a secondary installation at the Hiawassee Toll Plaza location. Also, District 5 controls and observes CFX’s ITS devices from the District 5 RTMC using center-to-center software. The use of center-to-center software for remote control, as well as the use of TSS email alerts are ways that CFX is pioneering the remotely controlled TMC concept. CFX is the first traffic management agency that does not have a traditional operations floor with stationed operators behind a video wall. The City of Tallahassee's RTMC is located within the City Hall at 300 Adams Street, in Tallahassee. This RTMC is operated through a Joint Project Agreement between FDOT and the City of Tallahassee. RTMC operators monitor and control the I-10 Freeway Management System as well as the Tallahassee Advanced Traffic Management System, which includes the local arterial street network. The RTMC is staffed 10-hours per day/5-days a week. The city is planning to move to a new RTMC in 2013. This proposed 90,000-square foot facility will house the City of Tallahassee RTMC, Leon County Emergency Operations Center, Joint Dispatch Center for Leon County and the City of Tallahassee, Fire Department Administration, Leon County Emergency Medical Services, and an emergency communications center for activation during area emergencies. In addition to the main building, it will also include a logistics building for emergency medical services and a site for a future City of Tallahassee fire station. The City of Tallahassee operates a portion of District 3’s roadway and operates the license plate readers on behalf of District 3.